Working inside the rules for the restricted carburetors like the 4412 500 CFM 2BBL Holley is difficult. Gauge Legal carbs, as many rules require, demand attention to detail like no other carburetor. We continually put effort into making these the best, most consistent carburetors available, and the results speak for themselves. Each track techs the carburetors differently, and it is very important that we know their procedure and the type of gauges they use. We are happy to use your core, and this will reduce the cost, as long as your parts pass our inspection. Please contact us for further information on these gauge legal 4412 carburetors, you will NOT be disappointed. Be sure to combine this carburetor with one of our custom carburetor spacers (when your rules allow). Gains with this 2BBL carburetor are substantial. 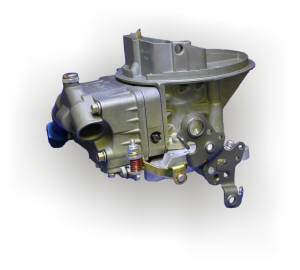 Join the winners using this carburetor in WISSOTA, ASA, PRO TRUCK, WESCAR, NASCAR, DIRT, and many others!